Hougen Mfg. 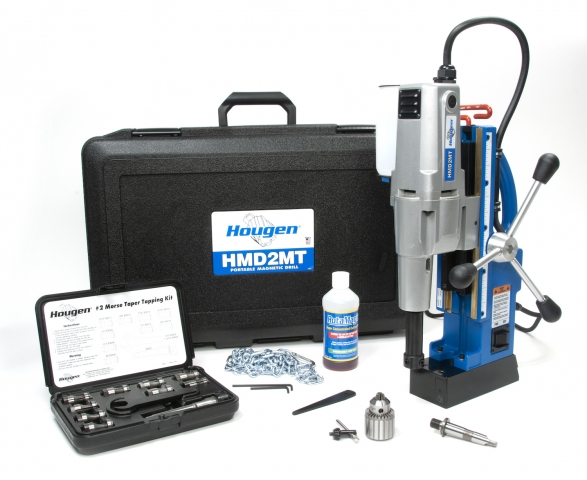 Inc. introduced the HMD2MT Fabricator’s Kit, which features the HMD2MT #2 Morse taper magnetic drill bundled with a number of accessories to give steel fabricators the ability to tackle more jobs by using fewer tools. The kit combines the drill along with the 83000 tapping kit, 08821 drill chuck adapter and a ½-in. drill chuck. Other optional #2 Morse taper accessories can be used with the drill such as taper shank drills, reamers and countersinks. The drill is powered by a two-speed motor with a forward/reverse option.